We have never been to Aruba but have certainly heard good things about it. 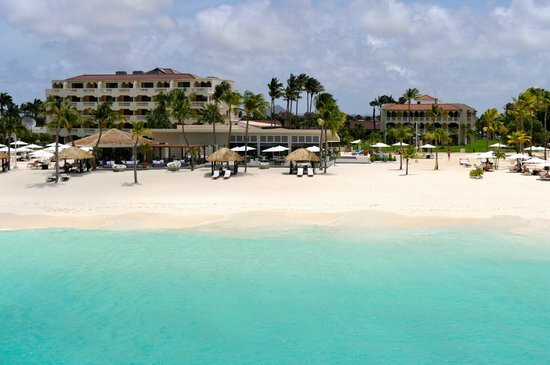 The Manchebo Beach Resort Aruba is a little boutique resort on Eagle Beach. We chose the optional all-inclusive program that included a-la-carte dining and an open bar. It sounded like the perfect place for our little romantic getaway. It boasts of having three restaurants: the French Steakhouse, Ike’s Bistro, and a more casual restaurant right on the beach called Pega-Pega Cafe and Beach Bar. Like all of these resort hotels, the Manchebo Beach Resort Aruba has a great spa called Spa del Sol which is a Caribbean-Balinese spa right on the beach. That is one of the first things I plan to do when I get there is get myself a massage on the beach. It sounds so relaxing and exotic. Then I’ll chase it with a strawberry margarita and I will be in vacation mode! There is some great shopping, I’m told, in downtown Oranjestad (Aruba’s capital), as well as more restaurant choices and nightlife. We may take a peek at that, but I’m more interested in the island of Aruba itself. Did you know you can actually see Venezuela from some spots in Aruba? It’s that close. I’m Googling Aruba daily now to make sure we don’t miss any of the sites that are worth seeing. I’m learning they have some fascinating rock formations there – mysterious would be a more fitting term. This place they have open to the public (for a charge) has giant round and oblong shaped rocks piled all over the landscape, some right on top of each other. No one knows for sure how they got there, but I’ve got to see them. Maybe we’ll rent a car or jeep one day to go sightseeing. I can’t wait for my Aruba getaway! There is just so much to see and do.